Key Difference: Rugby cleats are made of leather or durable synthetic, while Soccer cleats are made of kangaroo leather or full-grain leather. Rugby cleats have 10 cleats, while soccer cleats have 16. Rugby shoes do not have a toe cleat, while soccer shoes do. Some soccer shoes have wedge cleats, while these are not allowed in rugby. Cleats are specialized shoes that are used by sports players that are required to play on grass or a hard turf. A cleat is plastic or rubber stud that is placed on the bottom sole to give the player balance and keep them from slipping on the turf. Soccer cleats are also known as studs in some places. Soccer and Rugby require these cleats as it involves the players to run to grass or hard turfs. According to the requirement of each sport, the cleats are different. 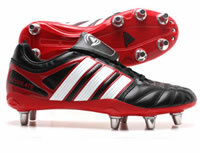 Rugby cleats are molded from leather as fitting is an important factor for the player. These days durable synthetic is also used for the uppers to make it more comfortable. Substances such as EVA (ethylene vinyl acetate) are used for insoles and outsoles. The cleats for rugby are made from hard plastic or aluminum. A rugby shoe has 10 cleats and does not include a toe cleat. The price range for a rugby cleat may vary from $30 to $300, depending on the brand. Soccer cleats are created from leather, such as kangaroo leather or full-grain leather, so that it sculpts to the player’s foot to provide maximum comfort and movement. The cleats are made of rubber or hard plastic. A rubber cleat is more preferable as it keeps the players from slipping on the grass and gives them grip. A soccer cleat has 16 cleats and includes a toe cleat. These shoes may also come with a wedge cleat for more grip on the field, however these cleats are not allowed in rugby. The price range for soccer cleats vary from $30 to $400, depending on the brand. Some soccer cleats can be used for rugby; however they must not contain the toe cleat, and must not have wedge cleats. Both of these are forbidden in rugby. Soccer cleats are shoes with studs used by soccer players. They are fitted to provide a player maximum support to help them run. Rugby Cleats are heavier shoes with studs, for more stability on the ground. Leather or durable synthetic uppers; EVA (ethylene vinyl acetate) insoles and split out soles. Cleats are made of hard plastic, aluminum.